Every evening when Dwayne comes home from work he tries to make sure he does something with William. Whether it is reading a couple books, playing outside or just getting on the floor to play with blocks/toys it has become a part of the weekly routine. For the past week they have been putting together a wooden puzzle that is the map of the United States. 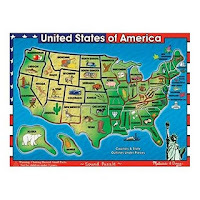 We recently got this neat puzzle from eBeanstalk called the USA Sound Map Puzzle by Melissa & Doug. Although it is intended for ages 6+ it still seemed like a great way to teach Will about the United States of America. This puzzle is unique since it "talks to you". When you place the state in the correct space on the map it tells you the name of the state as well as the capital city. William's eyes lit up the first time he heard it. 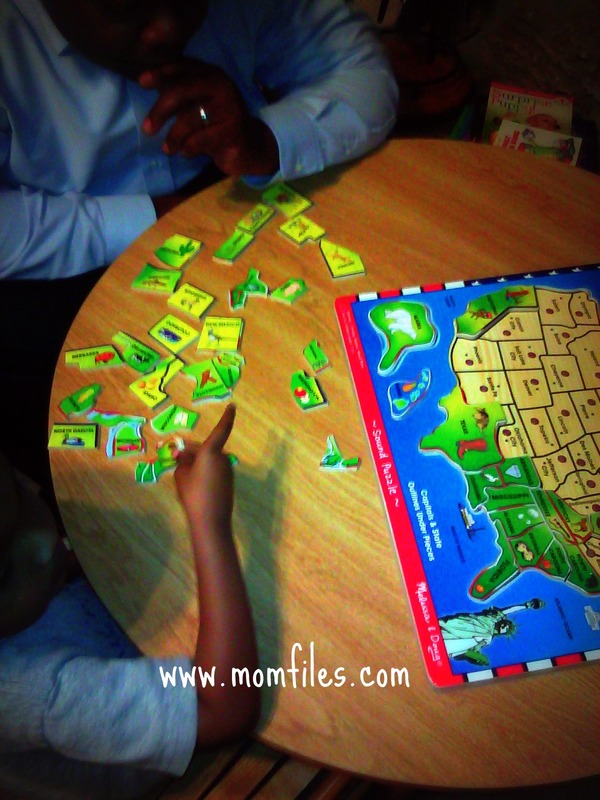 Does your child love to put together puzzles? Cool puzzle! My daughter loves puzzle. I love seeing her put them together because it doesn't take them long to master it. That's so neat! Geography is such an important subject, i love that William is getting this head start learning about it now. Girl, you are SO good. You really do motivate me to do better with Chase, and take advantage of the learning opportunities that I do have. I have a large-pieced puzzle at the house, but he sometimes gets frustrated when he can't fit them together, and doesn't always want my help, so that often ends badly. I think when he's a bit older he'll enjoy puzzles more. We love puzzles. I may have to look into getting that one. We love puzzles too and I remember doing a puzzle map like this with the kids (without the sound) and they just loved it and learn so much. They do want to learn. I'd love to hear the sound on this.